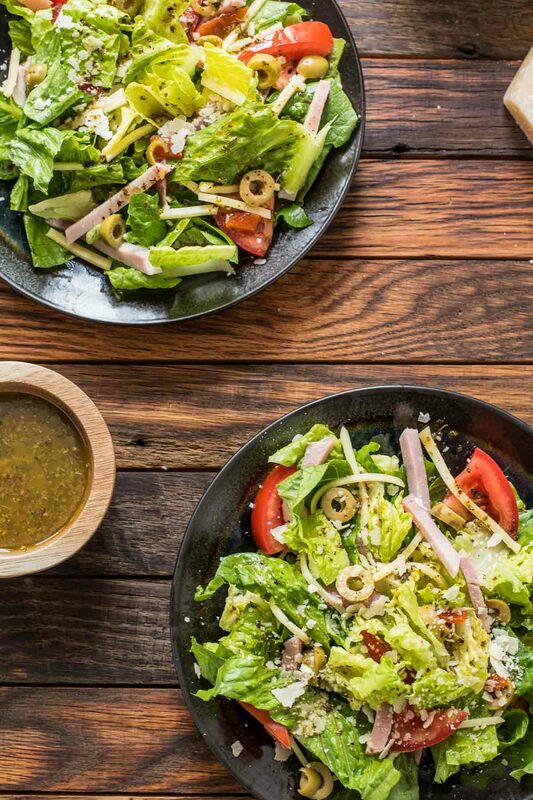 If you’re looking for a salad worthy of a main course, look no further than this 1905 Salad loaded with ham, Swiss cheese, olives, and a killer garlic dressing. Vacations look a little different for us since we added a tiny third person to our family. We used to spend our vacations sleeping in and checking out the hottest spots in the local food scene; now there’s a lot more early morning walks and ham and cheese sandwiches on the beach. I love traveling with our little family, but when my parents offered to watch the little guy for a day while we were in Florida, I knew we had to take advantage of it. A few blogger friends recommended Columbia restaurant for a nice dinner out, so the Mr. and I got all dolled up (and by that I mean, I wore a jersey dress and flip flops) and headed straight there. The Columbia is rather famous in the Tampa area. It’s been family owned and operated since 1905, and has been visited by the likes of Babe Ruth, Marilyn Monroe and George Clooney. The menu reads like a history book, and is dotted with black and white pictures of the family next to recipes passed down for generations. There’s a story behind almost every item on the menu, which made it harder than usual for me to decide what to get. I asked the waiter for a recommendation, picked a few things, then hoped for the best. What we got was a truly delicious and amazing experience from beginning to end. The table side sangria and seafood entrees were both incredible, but the most memorable part of the meal was the salad. I know. That never happens. But their 1905 Salad, which combines julienned ham and swiss cheese, olives, Romano cheese, and the most incredible garlic lemon dressing, was truly spectacular. That alongside a hunk of soft Cuban bread smeared with butter, and I was in heaven. When we got home, I knew I was going to have to recreate the salad. I looked up their website, and low and behold, they’re gracious enough to actually share the recipe on their site! I switched a few things out based on our tastes, but left most of it as is. I like to use romaine lettuce instead of iceberg, and Parmesan cheese instead of Romano. At the restaurant, they also dress the salad table side, adding the lemon juice and Worcestershire at the very end. 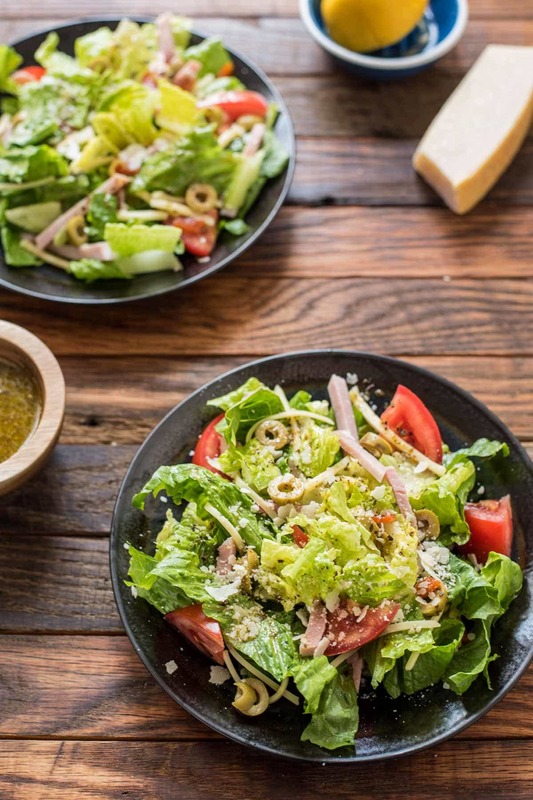 I found it was just as easy to mix these two ingredients into the dressing beforehand, though it sure does feel fancy to have a salad dressed right at your table! 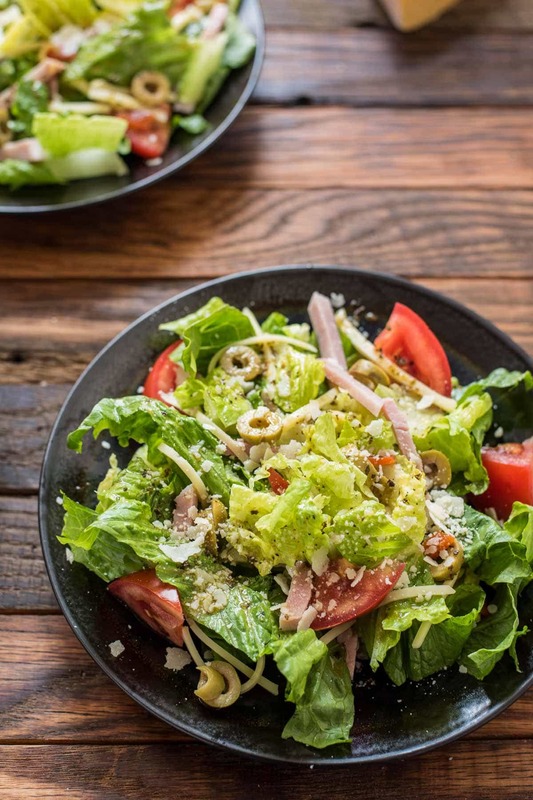 Ham and swiss in a salad is so clever, and this garlic dressing is LEGIT. I’ve never thought to put Worcestershire in a salad dressing, but it makes it wonderfully savory and acts as a nice counterpart to the puckery lemon juice. Tangy, fresh, garlicky, and filling, you can easily turn this salad into a main course (or multiple main courses if you’re like me and want to eat it every single day). Toss this one together on a weeknight and serve it with some excellent bread. It will be a meal you’ll remember! To make the dressing, whisk together the garlic, olive oil, and oregano in a medium bowl. Add the white wine vinegar and whisk thoroughly, until an emulsion forms. Whisk in the lemon juice and Worcestershire sauce. Refrigerate overnight or for at least one hour. Before serving, whisk thoroughly and season to taste with salt and pepper. 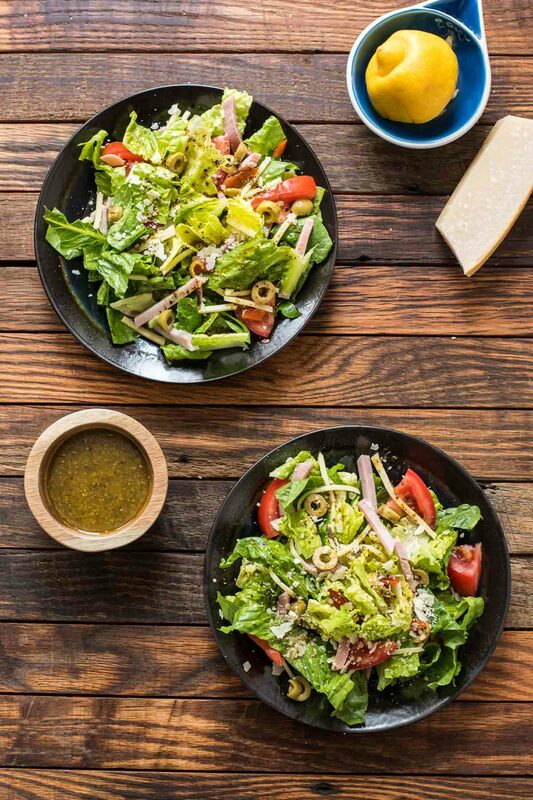 To make the salad, toss together the lettuce, tomato, ham, Swiss cheese, and olives in a large bowl. Toss the dressing with the salad greens until well coated. Sprinkle with grated cheese. Serve immediately. The salad is beautiful, but that dressing sounds amazing! !